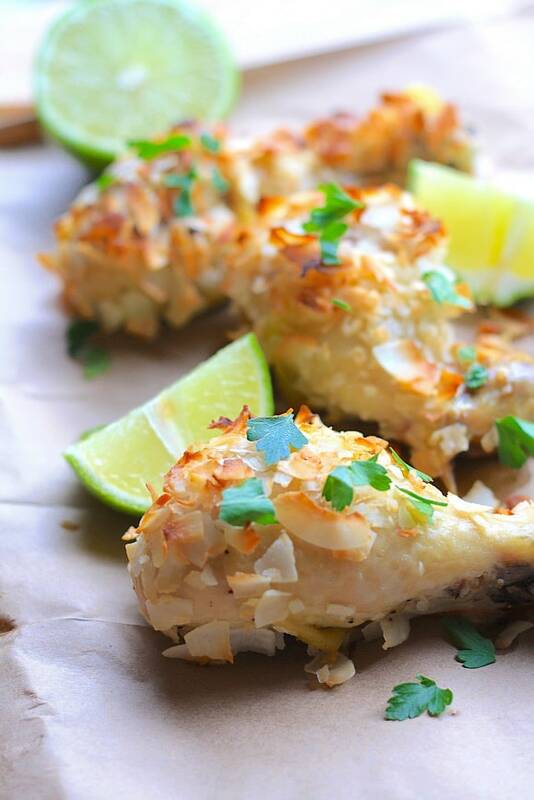 Oh my- Crispy Coconut Lime Chicken Drumsticks! These babies are deeeeeeeelish! Something about eating a drumstick feels so visceral; primal, if you will. I was in my zone. I was ready to chow. These things…and not to toot my own food horn, but – they’re just crazy good. I am partial to anything with coconut and lime. Drinks, smoothies, soap, chicken, lotion, tanning oil, shrimp…I’ve always been a coconut gal. Yum! Garnish with cilantro and lime wedges. Oh man guys- This Whole30 diet is making me want some junk food. Yeah- I feel great, and yeah- I’ve lost some weight (I went against the rules an weighed myself- couldn’t help it! ), but boy oh boy so I want something crispy and junk-food like! We’re having a small get together for the Super Bowl this weekend and I might even make them again. My guests’ aren’t on Whole30 so I’ll serve with some sweet chili dipping sauce, I think. This chicken makes me want to plan a trip to somewhere tropical. I think I’ll do that. My parents just got back from Maui and I was so jealous I had a hard time stomaching that they went without me and my hubby (first trip they’ve taken alone in 30 years). It’s fine. I’m fine. I’ll just be here in the frickin’ freezing cold Seattle weather. I’m fine. Funny- the older I get (28- a real geezer) I want sunshine more and more. I was so excited for Fall and Winter but after about 5 months of nastiness, I’m ready for some sunshine. My hubby and I have discussed moving to California a lot recently- I wouldn’t be surprised if we ended up there in a few years. He went to college there and loved it. Me? I just want palm trees and a pool, please. If you live in Southern California- what are your thoughts on living there? What are the best areas to raise a family? 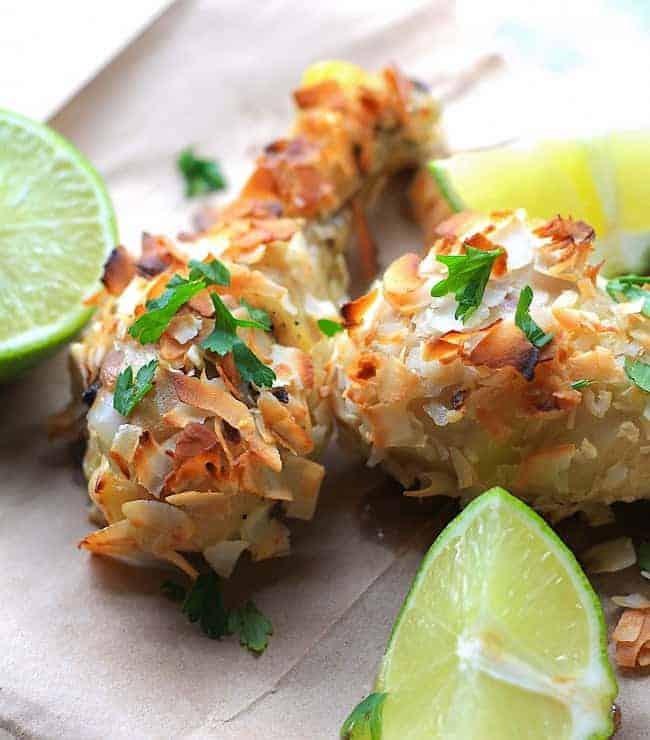 Jeez Louise- enough babble- enjoy these Crispy Coconut Lime Chicken Drumsticks and ‘go football’ on Sunday (I hate sports- no idea who’s even playing- I just like the Super Bowl for the food! lol!). Toast your coconut- we used Bob’s Red Mill because its a bit thicker of a shred. Bone Apple Teeth! (I saw a Youtube video where this kid couldn’t say ‘Bon Apetit’…Not sure why this cracks me up…Bizarre sense of humor). P.S. Do you like this recipe and want to try a few more like it? This Thai Chicken Coconut Curry will heal what’s missing! Oh man, guys…This stuff is amazing and so easy for a fabulously different weeknight meal. I’m a big fan of anything with the word ‘ball’ in it (again..bizarre sense of humor..) and these Jalapeno Popper Cheese Balls (ha..balls..) are a great game day appetizer! Coated in bacon, these will for sure be a crowd favorite! Sounds like a ball to me! Are you falling off of the diet wagon and need to hop back on? Click here for 12 easy, healthy and fresh recipe ideas! (Kind of like ‘every time a bell rings an angel earns its wings’, I gain a freakin’ pound anytime the word ‘diet’ is spoken. These recipes taste like you’re NOT dieting, but they’re in fact healthy and just so easy to make!). 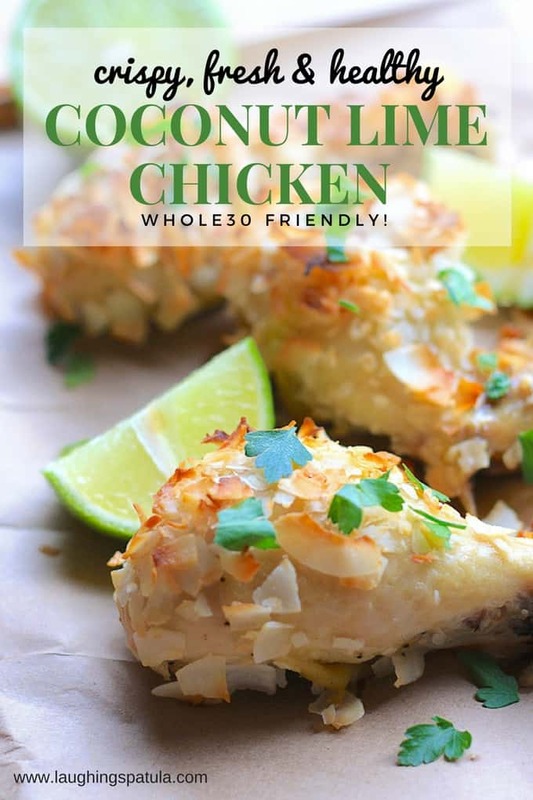 These delicious, Whole30 approved yummies are perfect for game day, or a weeknight dinner! 1 Package Chicken Drumsticks (with skin) Mine had 8 to a pack, figure 2 per person for an appetizer, or 3 per person for dinner. 1 Cup Unsweetened Coconut Flakes I use Bob's Red Mill because they're bigger flakes. If you aren't on Whole30, use sweetened for a great salty/sweet punch! Preheat oven to 400 degrees. Line baking sheet with foil, spray with nonstick, and set aside. Mix marinade in large size bowl with room for chicken to soak. Cut slices in drumstick meat, under the chicken skin (this will help infuse flavor). Add chicken to marinade mixture and rub the mixture into the chicken. In a separate bowl, combine the "breading" ingredients. 1 by 1, transfer drumsticks to "breading", ensuring drumsticks are full coated in coconut flake mixture. 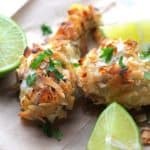 Add "breaded" chicken drumsticks to sheet pan, and when finished, cover with a piece of foil (this helps the coconut not burn while baking). Place on a festive platter, and squeeze lime juice over drumsticks. Garnishes well with parsley, or lime zest. Serve with sweet and sour, or sweet chili sauce (both are NOT Whole30 compliant, FYI) and enjoy! I live in the City of San Diego and, hyes, the weather is can be equaled. neighborhoods have to be researched carefully as well as schools because we do have gangs here. As for a house and a pool, please let me add central air conditioning. Are you independently wealthy? I don’t know where you live now but when I moved here I was shocked that for the exact same job I had in the Boston area, I was expected to accept a salary that was two-three thousand dollars less than I earned in Boston with the exact same crazy rent. Paleo Cupcake, I think is the FB page, also lives here in San Diego someplace. I don’t know if she lives in the City or the County. You might check with her. Housing costs a LOT, Rent has skyrocketed. Costs of private homes is outrageous. I live the San Diego area. IT IS BEAUTIFUL, 365!!! Really, we rarely get bad weather. I live farther east than from the water, so it’s hotter. I’m only 20 minutes from the water though, If I could like ANYWHERE in CA, it would DEFINITELY be here!!! I was born in Brooklyn, NY. When I was 9 mos. old, my dad told my mom, “we are NOT raising our children here. So off we went to the LA area, where he had family. We moved to San Bernardino County when I was 10, but moved one last time to San Diego when I was 13. San Diego is by far the best. We’ve been here ever since. 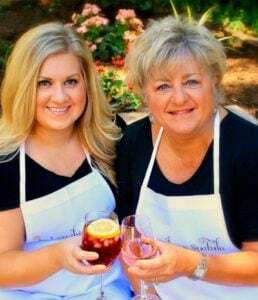 My husband was born in San Diego and we have raised 3 beautiful, Southern California girls. Not only do we have terrific weather, but the food scene here is wonderful. So much history too. You’d be super happy here! OH, AND YOUR RECIPE!!!! I CAN’T WAIT TO MAKE IT! PERFECT, AS ALWAYS! Rosemarie! Hi! Oceanside is one of the cities we’ve looked at, I think that’s by you, actually! We went to Newport not too long ago and did some house hunting and hung out in the area, but honestly- it’s waaaayyyy too uppity for me- too much money in one spot! So glad to hear you like the San Diego area so much- will look into it more!